This book covers a wide range of subjects concerned with the repairing and making of clocks and some of the tools required in this work. The opening chapters cover routine overhauls to four different types of clock. These descriptions detail the common procedures of pivot polishing, rebushing and other repairs. The processes are fully illustrated. Then follows a series of short chapters dealing with problems such as handling main springs, a loose pendulum bob, a damaged spring barrel, a bent plate pillar, taper pins, restoring antique clock screws, rack tail replacement and fitting steady pins etc. 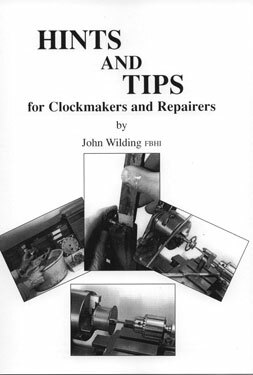 A section on the use of the small lathe in making parts for clocks follows, and the book concludes with a description of the John Wilding depthing tool and wheel crossing template.